Famous all over the world for the production of the ceramics, Castelli rises during the Carolingia age (IX-X sec.) with the phenomenon of the "incastellamento" (building castle) that characterizes the cities in the High Middle Ages. The dates 1000 registeres the presence Benedictines monks in the Abbey of Saint Salvatore. Castelli firstly is property of the counts of Pagliara and then of the family Orsini (1340). In 1526, for wanting of the emperor Carl V, passes to marquises of Mendoza who will manage it for centuries. Maximum monument of Castelli is the Parrochiale di San Giovanni Batista (XVI sec.) that keeps precious majolicate works. Not far from the village there's the Church of Saint Donato in which is possible to admire splendid ceiling adorned with ceramics ('600), maximum expression of the art of ceramics in Castelli. 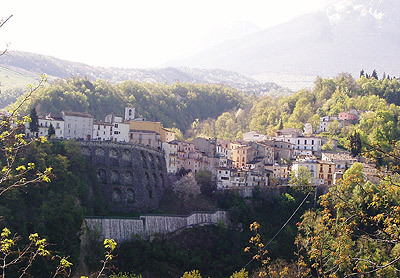 The village, for its vicinity to the Gran Sasso of Italy, is an ideal base of departure for the excursions and ascensions to the higher mount of Central Italy.